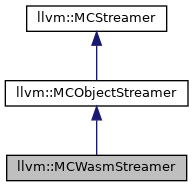 Definition at line 27 of file MCWasmStreamer.h. Definition at line 29 of file MCWasmStreamer.h. Definition at line 60 of file MCWasmStreamer.cpp. References llvm::HexStyle::Asm, llvm::MCObjectStreamer::ChangeSection(), llvm::MCObjectStreamer::getAssembler(), llvm::MCSection::getBeginSymbol(), llvm::MCAssembler::registerSymbol(), and llvm::ARMBuildAttrs::Section. Definition at line 52 of file MCWasmStreamer.cpp. References llvm::MCObjectStreamer::getAssembler(), llvm::MCAssembler::getBackend(), llvm::MCAsmBackend::handleAssemblerFlag(), and llvm_unreachable. Definition at line 137 of file MCWasmStreamer.cpp. Definition at line 142 of file MCWasmStreamer.cpp. Definition at line 163 of file MCWasmStreamer.cpp. References llvm::SmallVectorImpl< T >::append(), llvm::SmallVectorTemplateCommon< T, typename >::begin(), E, llvm::MCObjectStreamer::EmitInstToFragment(), llvm::MCCodeEmitter::encodeInstruction(), llvm::SmallVectorTemplateCommon< T, typename >::end(), llvm::MCObjectStreamer::getAssembler(), llvm::MCEncodedFragmentWithContents< ContentsSize >::getContents(), llvm::MCAssembler::getEmitter(), llvm::MCEncodedFragmentWithFixups< ContentsSize, FixupsSize >::getFixups(), llvm::getOffset(), llvm::MCObjectStreamer::getOrCreateDataFragment(), I, llvm::MCEncodedFragment::setHasInstructions(), and llvm::SmallVectorBase::size(). Definition at line 146 of file MCWasmStreamer.cpp. Definition at line 80 of file MCWasmStreamer.cpp. References assert(), llvm::MCObjectStreamer::getAssembler(), llvm_unreachable, llvm::MCSA_Cold, llvm::MCSA_ELF_TypeFunction, llvm::MCSA_ELF_TypeObject, llvm::MCSA_Global, llvm::MCSA_Hidden, llvm::MCSA_IndirectSymbol, llvm::MCSA_Invalid, llvm::MCSA_LazyReference, llvm::MCSA_NoDeadStrip, llvm::MCSA_PrivateExtern, llvm::MCSA_Protected, llvm::MCSA_Reference, llvm::MCSA_SymbolResolver, llvm::MCSA_Weak, llvm::MCSA_WeakDefAutoPrivate, llvm::MCSA_WeakDefinition, llvm::MCSA_WeakReference, llvm::MCAssembler::registerSymbol(), llvm::ARMBuildAttrs::Symbol, and llvm::wasm::WASM_SYMBOL_TYPE_FUNCTION. Definition at line 216 of file MCWasmStreamer.cpp. Definition at line 226 of file MCWasmStreamer.cpp. Definition at line 212 of file MCWasmStreamer.cpp. Definition at line 151 of file MCWasmStreamer.cpp. Definition at line 156 of file MCWasmStreamer.cpp. Definition at line 72 of file MCWasmStreamer.cpp. Definition at line 220 of file MCWasmStreamer.cpp. Definition at line 194 of file MCWasmStreamer.cpp. Definition at line 39 of file MCWasmStreamer.h. References llvm::LCOMM::ByteAlignment, ChangeSection(), EmitAssemblerFlag(), EmitCommonSymbol(), emitELFSize(), EmitIdent(), EmitLocalCommonSymbol(), EmitSymbolAttribute(), EmitSymbolDesc(), EmitTBSSSymbol(), EmitThumbFunc(), EmitValueImpl(), EmitValueToAlignment(), EmitWeakReference(), EmitZerofill(), FinishImpl(), llvm::MCObjectStreamer::reset(), llvm::ARMBuildAttrs::Section, Size, and llvm::ARMBuildAttrs::Symbol.